Ask fellow campers about "Viking Village Campground & Resort" and nearby attractions. First let me say this place is beautiful. The sites are spacious. The grass and grounds are well taken care of. There is a nice pool. Now for the negatives: There is no sign on the road to indicate the entrance to the park. Internal roads are a little narrow and dirt/gravel. Most sites are not level, we were able to move sites to get a level one (17). Staff that checked us in gave us no information regarding rules, trash, etc. and no paperwork. Our mail had been delivered before we arrived but the staff was not able to find it. It took till late the day after we arrived to find our mail on our front step SOAKING WET! No explanation was given. Over the weekend the voltage dropped to 106. The staff was aware there was a problem but we were not alerted or compensated. We were not able to use A/C the entire weekend we were here. WARNING: There are recessed fire pits in every site and some are very hard to see. It would be easy to miss them and fall in and have a terrible accident......very dangerous in my opinion. There are low hanging branches in many sites that need to be trimmed. 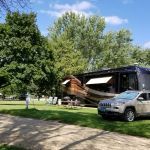 We paid the weekly rate but at first they charged us wrong (daily rate) and I had to go back to the office to get it corrected.. We camped at Viking Village Campground & Resort in a Motorhome. Taliesen (home of Frank Lloyd Wright) Tour in Spring Green. Bike around Lake Menona. Visit UW-Madison campus and Capitol bldg. Saturday Farmers Market at the Capitol Square. The cost was high given what you got. There was no WiFi and no cable tv. There wasn't even a sign on the roadway with the name of the campground. The sites were spacious although the trees were very close and required careful maneuvering in and out of the space. There was no dog area. The hookups worked fine. The two teenage girls behind the counter gave minimal information and had to be pumped for basic information. They handed out no paperwork at all - no rules, no map, etc. Two washers and two dryers were $1.00 each. There was a pool and putt putt golf available. We camped at Viking Village Campground & Resort in a Fifth Wheel. See the capitol. Drive to Green Spring to see the House on the Rock. Cave of the Mounds was interesting. This is a huge place, and I don't mean in the number of sites. There are two large grassy fields in front (and about a hundred geese when I was there), lots of space between sites, and lots of grass and trees all around. Nice little miniature golf course, nice pool area, and plenty of room for kids to run around. Lady at office was super friendly and helpful. Park was extremely clean and well cared for, grass was mowed and trees were trimmed. Only there for one night but will definitely stay there again. We camped at Viking Village Campground & Resort in a Motorhome. We've stayed here several times. It is a very nice campground, although a bit expensive. However, there do not seem to be many options in the Madison area, and we will likely stay here again. All utilities worked well, but the sewer connection was far forward on the site we were on (69). There is no cable TV, but you can get lot's of channels with an antenna. Our phones worked well (Verizon). Interior roads are a little tight. Campsite spacing varies; we were pretty close to neighbors on both sides, but there are some sites with a lot more room between neighbors. We camped at Viking Village Campground & Resort in a Motorhome. As far as private parks go in WI this is one of the better ones. The grounds are in good shape the pool area is nice and there is a ton of green space. The sites are somewhat spacious and all are full hookups. We traveled with a group of 4 other trailers and they all felt the same. The only negative was our site was a bit raised and the step to the ground was a big one. We camped at Viking Village Campground & Resort in a Travel Trailer. Hit the Madison farmers market on Saturday. Wont disappoint. Nobody was in the office when we arrived or during our stay. We had to call the owner to check in, get a site, and pay the balance of our bill. We were given a choice of three sites and chose the one that had the least mud by the entrance to our motorhome. The campground seemed more geared to special events and long term residents versus those, like us, visiting friends and relatives in the area. Although this campground was OK, it was a little pricey and we'll probably stay at another campground on our next visit. We camped at Viking Village Campground & Resort in a Motorhome. There's a nice county park across the street and Lake Kegonsa State Park is nearby. We visited some friends that have an Airstream here on a permanent site. The grounds are very clean and well kept. The activity area's for the kids are far enough away to keep the site area's nice and quiet. There is a state park just out the driveway and across the road for a nice little walk and some nature viewing. We camped at Viking Village Campground & Resort in a Travel Trailer. Viking County park is just on the other side of hwy N. and provides some beautiful views of the lower Yahara River before it flows into the Rock River. This is a nice place for a picnic or little hike. If you have a canoe or smaller boat this could be a nice place for a paddle. We didn't get to fishing so I can't comment on that. We used to stay here quite often but we found another campground that was just as nice and was cheaper. The owner can be very unfriendly. Also if there is a special occasion going on the campers take second or third place. The time we stayed there a special occasion was in progress and we complained about no paper towels or toilet paper in the bathrooms, They never did anything about it. Also, my niece was told she couldn't swim in the pool while this event was going on! Like I said we were treated like the lowest because we weren't involved in the "special event". We camped at Viking Village Campground & Resort in a Fifth Wheel. Pretty grounds and close to Madison. Gravel parking surrounded by grass with nice shade trees. Good power, water, and over the air TV. Gravel was mounded on the sites, ours was not quite wide enough for the wheels of our camper, and had a 12" slope to the surrounding grass. Others were better. Sites are back in, and you have to disconnect and park parallel to the road in front of your site. Huge grassy area behind camper. Lots of big rigs here, no problem. Would stay again. 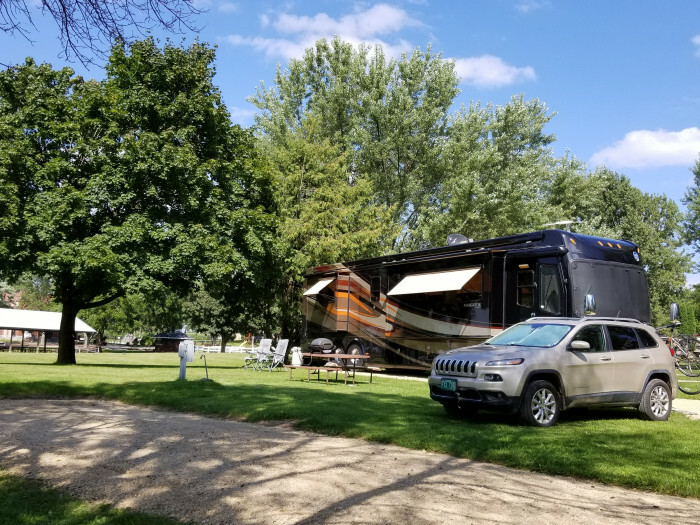 We camped at Viking Village Campground & Resort in a Fifth Wheel. County park across the street has a great dog swim area. Big rig friendly with level sites. Shower and laundry were good. No problem with using our satellite. No dog park but beautiful large fields to walk dog. Great campground to ride bicycle. No wifi anywhere at site nor office. This is a motorcycle friendly area. We camped at Viking Village Campground & Resort in a Travel Trailer. Madison is about 10 miles with capital and shopping. Went to truck pull in Utica festival which was very interesting and free. Grocery store and free summer concerts in Stoughton about 4 miles. This RV park has history. We didn't find out anything beyond the details in Google. There is space, lots of space, mowed, clean open space and huge trees. Sites are grass and gravel, yes grass. We did not have a neighbor on either side, so hard to tell exactly how tight the sites are but seem spacious. We had W/E and the dump station is awkward to get to, not impossible. There is a pool, mini golf which we did not use. Lots of dog walking area. Quiet campground when we were here. They do large group events and one was starting as we left. Those groups use the restrooms too. We camped at Viking Village Campground & Resort in a Travel Trailer. The Yahara river is quite near with a public boat launch just up the road. If you fish it is worth casting in a line. For kayaking: don't bother. Nothing scenic, lots of shallow water, with grass, water weeds and algae. This is a diamond in rural Wisconsin! It is clearly one of, if not the prettiest of the more than 275 campgrounds we've stayed at all across the US and Canada. A treed entrance is reminiscent of a southern plantation, acres of lawns, extremely quite, a pool and miniature golf for those interested and extremely wide full-service sites ... albeit without cable. However, over-the-air television out of Madison is more than acceptable. The campground is located on property once used as a school for orphaned, and later troubled youth. Just 2 miles from Stoughton, a quaint, old-fashioned town. If we were not on a schedule we could stay here for many more days. We only wish the young gals staffing the office had more information about the property's history and local area. Still, this is only the third "10" we've ever given any campground! We camped at Viking Village Campground & Resort in a Motorhome. Just 14 miles south of and convenient to Madison. We were leaving the Chicago area and heading towards Madison to see an old friend. first visit to the area with the coach and I was looking for something close to her home and just stumbled on Stoughton. Almost passed on Viking Village because of another review that complained about the elec power. SO glad that I chose to stay there!! The grounds are immaculate ... it was formerly a Children's Home (orphanage) in the late 1880s and forward ... and has been family run for many years as a campground and recreation location. There is a lovely pool, picnic pavilion, miniature golf and expansive lawns for all sorts of games and large groups. There are a fair number of seasonal tenants who leave trailers or campers there, but every site is as neat as a pin. The water pressure is not the highest, but it was just fine and came with a pressure regulator. The power was steady and even on our 50amp pedestal. We had a site with full hookups and the sewer location was perfect. Trash is picked up at your site daily. All sites are gravel and most are level. I saw fire pit/rings and picnic tables at almost every site, as well. If this place had wifi it would have gotten perfect marks in every category!! The entertainment was watching and listening to the sandhill crane pairs that wander the park as though they own it! I can't say enough about the owner, who is friendly and generous and interested in the residents. I would return here in a heartbeat! It is easy to get to Madison (18 miles) and there is access to MANY lakes and parks for fishing or whatever. We camped at Viking Village Campground & Resort in a Motorhome. Make a reservation, especially on a weekend, when almost every spot is filled!! Beware - this campground has a problem with low voltage and owner knows about it. Owner doesn't understand this problem and advises that campers should conserve energy so low voltage doesn't occur. Also said it occurs when too many RV's come in - then limit the number! Was told if we were unhappy, we could leave. Damage can result from this condition. Also, sites were not very level. Very nice grounds though. But we will pass on this location in the future. We camped at Viking Village Campground & Resort in a Motorhome. This is a great park that is convenient to Madison. Spaces are large and very easy to get into and out of. We were in site 15 which was level. We will stay here again. We camped at Viking Village Campground & Resort in a Motorhome. Are you affiliated with Viking Village Campground & Resort ?